bl.uk > Online Gallery Home	> Online exhibitions	> Asia, Pacific and Africa Collections	> Sailors' Home [Bombay]. Photograph of the Sailor's Home buildingl, taken by an unknown photographer in the 1870s in Bombay (Mumbai), Maharashtra, from an album of 40 prints mostly dating from the 1860s. Bombay, the capital of Maharashtra and one of India's major industrial centres and a busy port, was originally the site of seven islands on the west coast, sparsely populated by Koli fisherfolk. Bombay was by the 14th century controlled by the Gujarat Sultanate who ceded it to the Portuguese in the 16th century. In 1661 it passed to the English as part of the dowry brought to Charles II by the Portuguese princess Catherine of Braganza. By the 19th century Bombay was a prosperous centre for commerce. The removal of the ramparts of the fort had opened up the city to fresh developments in architecture, and in the second half of the 19th century Bombay witnessed accelerated building activity fuelled by its booming maritime trade. A collection of grand public buildings sprang up at the Esplanade and city centre. 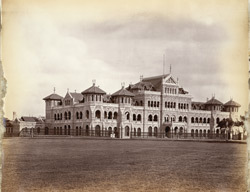 The Royal Alfred Sailors' Home was completed in 1876 and is now the Bombay Council Hall. The building was designed by the architect Frederick William Stevens, an engineer with the Indian Public Works Department.